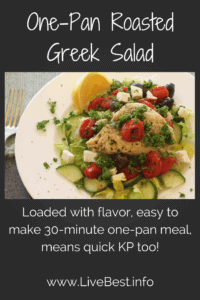 Loaded with flavor, this easy to make 30-minute One Sheet Roasted Greek Salad, means quick KP too! A dinner winner! Sometimes when I taste a new recipe I stop midbite. Then say: Wow! Roasted Greek Chicken Salad. This is one of those recipes. Bigger, Better, Best. 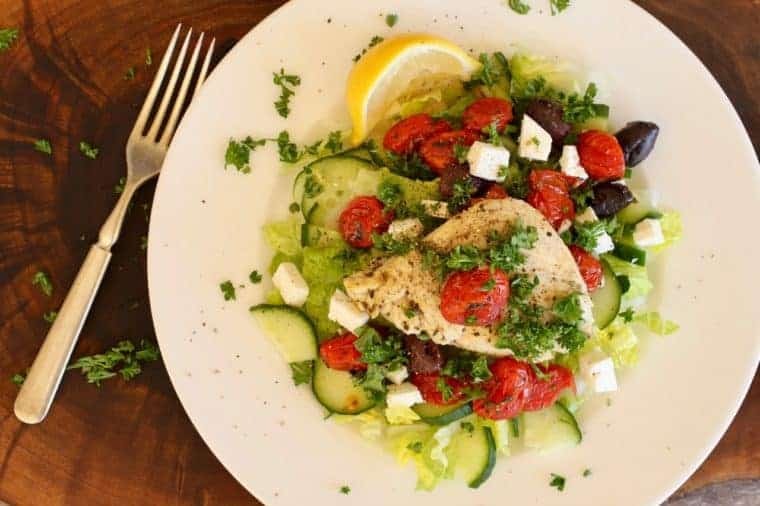 Greek Chicken Salad. 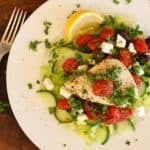 My plan was to make a quick Greek Chicken Salad. But decided to go bigger. Rather than raw tomatoes, I turned on the oven and roasted them with olives and capers in an oven-proof skillet. I like All-Clad skillets and used a 12-inch one for this recipe. You can use a baking sheet too. Then I went better. I set herb-rubbed chicken over the tomatoes. To reduce the cooking time, I pounded the chicken. And it worked, I had dinner on the table in about half an hour. Then I went best. 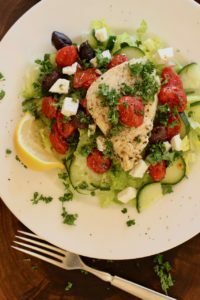 Just before serving, I piled all those cooked foods on to fresh lettuce and sliced cucumbers then sprinkled it all with feta cheese and a squirt of fresh lemon juice. That’s when I swooned. I pronounced this as ideal cooking because it was easy, but looked like more, and it was full of flavors. Use this handy dandy book to track what you served to who. Well, I cranked the oven to 450° F. In a heavy pan, I added tomatoes, olives, capers and herbs. Baked that. I pounded the chicken breast with a meat mallet into a 1/2-inch thickness. This drives the herbs in, tenderizes the meat and is the reason this dish is on the table in 30 minutes. Then I baked a little longer. We’ve eaten this one-sheet Greek Chicken Salad several times since. It’s easy. I love cooking ingredients together in one pan for a simple dinner. It’s flavorful. Tomatoes, olives, capers, feta cheese and herbs add deliciousness. It’s healthy. Lean chicken is an excellent protein source. Cherry tomatoes are packed with potassium, vitamin C, and lycopene. Lycopene, a plant compound that helps protect cells, is better absorbed from cooked tomatoes. Oil helps with absorption and olive oil has an edge over other oils. With one pan, clean-up isn’t bad either! Let me know what you think of the recipe. Here’s another one-pan recipe Peanut Asian Rice Bowl. P.S. 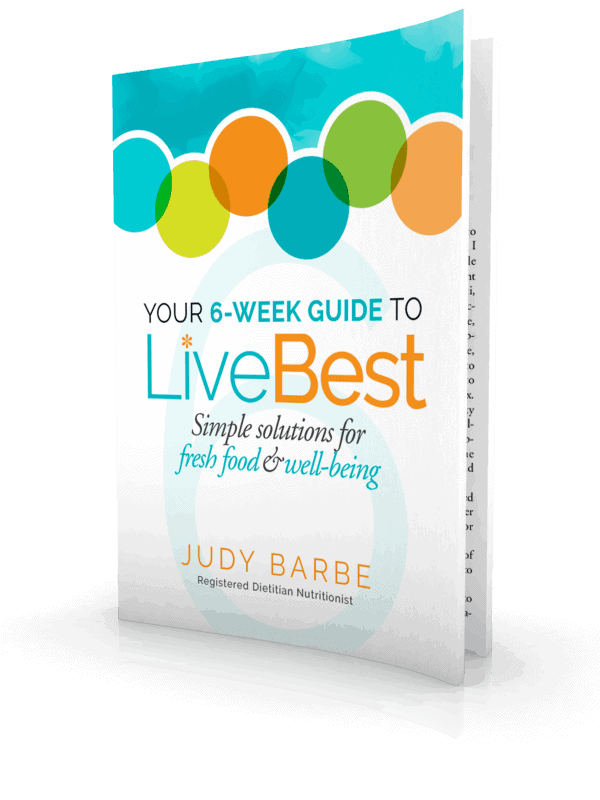 If you like this post, you might enjoy my LiveBest newsletter. Receive each new post delivered to your Inbox. Sign up right here. Pinky promise I won’t overwhelm you with endless STUFF! P.S.S. If you want to jumpstart healthier eating, I created a free, 5-day challenge you can join by clicking this link. You’ll get tips and tools, resources and recipes to create your own roadmap to meet your fiber goals. Don’t ya? Won’t ya? Seriously, it’s only 5 days 😉 Find it right here. Pin it for later. Rate it below, please. Loaded with flavor, this easy to make 30-minute one-pan meal, means quick KP too! A dinner winner! 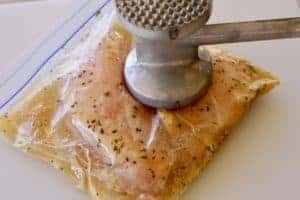 Chicken: Heat over to 450° F. In a zip-top bag, combine chicken, 1 teaspoon olive oil, 1/2 teaspoon dried basil, 1/2 teaspoon dried oregano. Seal bag. Massage it to coat the chicken with herbs. Pound with meat mallet until 1/2-inch thick. Cook: In a 10-inch ovenproof skillet, combine cherry tomatoes, Kalamata olives, capers, vinegar, 1 teaspoon olive oil, 1/2 teaspoon dried oregano, 1/2 teaspoon dried basil, 1/4 teaspoon each salt and pepper. Place in oven. Cook for 15 minutes. Then: While tomatoes are cooking, pound chicken breasts with a meat mallet until they are 1/2-inch thick. After first 15 minutes, lay chicken breasts over tomato/olive mixture. Return pan to oven and cook 15 minutes more. Salad: Layer Romaine and cucumber on dinner plates. Top with chicken, tomato/olive mixture, pan juices. Sprinkle feta and squeeze lemon juice over top. Love the weight of these pans. No warping. One of the most frequently used items in my kitchen. Drips and spills rinse away with these silpat pan liners. This post contains affiliate links. That means if you click through and make a purchase, the seller pays me a commission. It does not impact the pice you pay. So creative! And such great flavors!